If your iPhone contains duplicate music, the easiest way to remove duplicates is to ensure that your iTunes library is free of duplicates and then resync your iPhone to iTunes. Sync your updated iTunes library with your iPhone to upload your new duplicate free library to your device. 1. Firstly, you will need to check if the duplicate music is present in your iTunes library as well as on your iPhone. You can use Tune Sweeper to do this by doubling clicking on the Tune Sweeper icon to run the program, then selecting "Search For Duplicates". 2. If your iTunes library does not contain any duplicate tracks and also contains your full collection of music, you can simply re-sync your iPhone to your iTunes library and it should remove any duplicate tracks on your iPhone. See step 5. 3. If the duplicate tracks are not in your iTunes library on your PC/Mac, and the library is incomplete (i.e. missing songs which are on the iPhone), you will need to use our other product, TouchCopy, to copy all of your music from your iPhone to your iTunes library on your PC/Mac before attempting to remove any duplicates. Otherwise when you attempt to re-sync your iPhone with iTunes, only the music within iTunes will be added to your iPhone. Please note: any music which is on your iPhone but is not in your iTunes library will be deleted from your iPhone when syncing with iTunes. TouchCopy allows you to safely copy your music from your iPhone to your iTunes library without the risk of it being deleted. For more information on our product TouchCopy, you can view the online user manual for it here. 4. Once the duplicate tracks have been found on your PC/Mac, you can use Tune Sweeper to remove them using the duplicates function. Once the duplicate tracks have been found, you can choose which track from each group you would like to keep. After all selections have been made, click the "Remove Duplicates" button to clean up your iTunes library. For more information on how to use Tune Sweeper to do this, you can view the online user manual for Tune Sweeper 4 here. 5. Now that all the duplicate music has been removed and your iTunes library is complete on your PC/Mac, you are ready to re-sync your iTunes library to your iPhone. Connect your iPhone to your PC/Mac and run iTunes. Select your iPhone in the source list in iTunes. In the main iTunes Window (under the "Summary" tab) scroll down to the bottom. 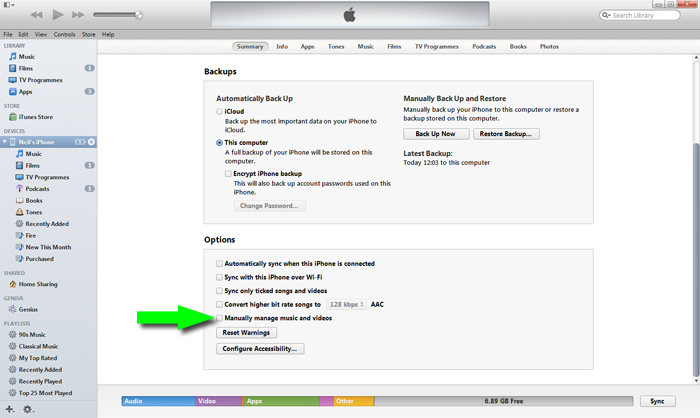 Uncheck "Manually manage music and videos". 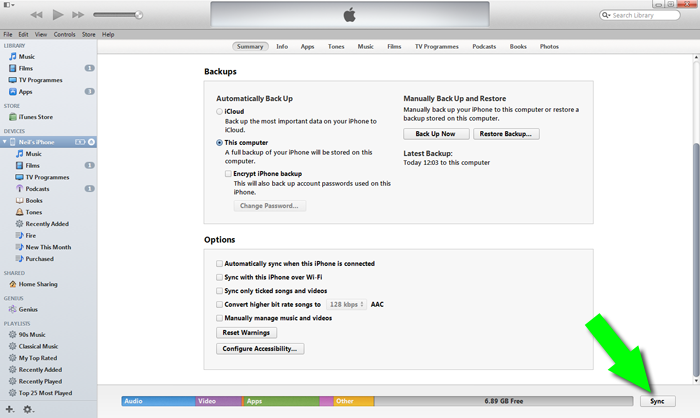 Setting iTunes like this ensures that your music and videos are automatically synced with iTunes. You can check this by clicking on the Music Tab in iTunes and ensuring that the "Sync music" box is checked. In addition to this, if you wish to sync your Podcasts, Games and Contacts, click on the relevant tab in iTunes, check the "Sync" box, and then click on the Sync button at the bottom of the screen. 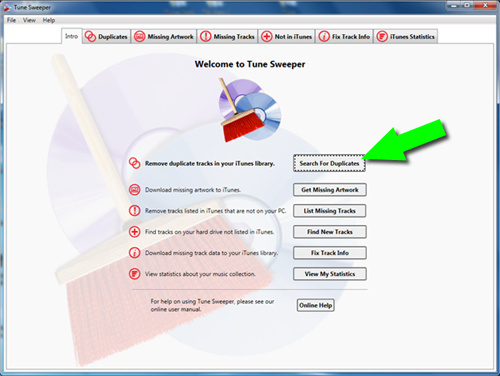 After following these steps, see this article if you have issues with Tune Sweeper removing duplicates from your iTunes.